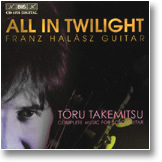 Imported from JapanTwelve classic pop-melodies arranged for guitar by the great Japanese composer Toru Takemitsu. Including music by Harold Arlen, George Gershwin and the Beatles, these are the actual arrangements heard on countless classical guitar recordings, including recent releases by Manuel Barrueco, John Williams, Franz Halasz, Göran Söllscher, and Sharon Isbin. These arrangements will require some work to master, and are definitely intended for the experienced player. However, once mastered you will forever have a dozen performance quality pieces added to your repertoire. Music notation, No Tab. Very highly recommended! Imported from AustriaCritically acclaimed CD by American-born guitar master Franz Halasz. 24 brilliant performances that document Toru Takemitsu's complete works for the guitar. Included here are the entire contents of Takemitsu's 12 Songs for Guitar (Book sold separately - see above.) Very highly recommended!